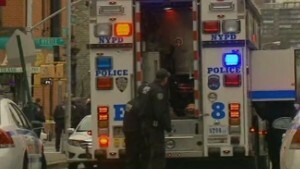 Rep. Gregory Meeks, a member of the Congressional Black Caucus, said "we stand with the police department"
Washington (CNN) -- Several police officials and politicians are pointing fingers at New York City Mayor Bill de Blasio after two New York City police officers were murdered on Saturday, following weeks of protests against police treatment of minorities in New York and around the country. And one is pulling the President of the United States into the fray. The head of New York City's police union said de Blasio has blood on his hands, and the state's former Republican governor called out de Blasio and U.S. Attorney General Eric Holder. Former New York City mayor and one-time Republican presidential candidate Rudy Giuliani appeared to sympathize with de Blasio on Sunday, instead dragging in President Barack Obama. "We've had four months of propaganda starting with the President, that everybody should hate the police. 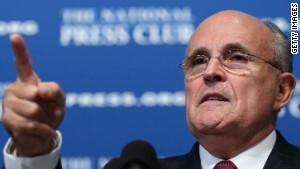 I don't care how you want to describe it, that's what those protests are all about," Giuliani said Sunday on Fox News. Giuliani added on CNN that while none were responsible for the shooting, de Blasio, Holder and Obama are fueling "intense, anti-police hatred." "Maybe, just maybe, they should spend the next four months not talking about police hatred, but talking about what they are going to do about bringing down crime in the community," he said, adding that it's police officers and not Obama, Holder or any mayors who are saving lives. Protests broke out around the country in the wake of two separate cases in which grand juries declined to charge white police officers in the killing of two unarmed black men, Michael Brown in Ferguson, Missouri, and Eric Garner, in New York City. Obama has sympathized with protesters' frustrations, drawing on his own experiences as a black man, and urged protesters to express themselves peacefully. Former Gov. George Pataki blamed de Blasio and Holder. And the head of NYPD's police union, Patrick Lynch, pointed the finger at de Blasio, saying there's blood on the hands of those supporting the protestors and it "starts on the steps of city hall in the office of the mayor." Giuliani also condemned Rev. Al Sharpton, one of the main organizers and supporters of the protest movement, for creating an atmosphere of "strong anti-police hatred in certain communities." "And for that they should be ashamed of themselves," Giuliani said. 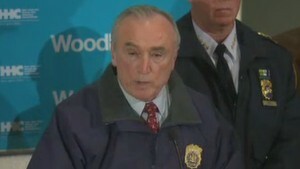 Sharpton strongly condemned the attacks on Sunday. Giuliani said asking for de Blasio's resignation and blaming him for the killings of the two NYPD officers "goes too far," but said de Blasio should be more forceful in policing the protests that have on several occasions taken over major streets in New York City. Republican Sen. Lindsey Graham of South Carolina made his position clear on CBS Sunday morning as the blame game evolved. "I blame the shooter and nobody else," he said. 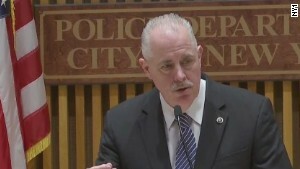 "The tone they're setting around the rhetoric regarding the cops incites crazy people. But I blame the shooter." Mayor Bill de Blasio condemned the killings on Saturday night, calling the double-murder a "heinous attack" that "was an attack on our entire city," which he said "tears at the foundation of our society." Rep. Gregory Meeks, a Democrat who represents parts of New York City, lauded those comments and said de Blasio and protest leaders have tried to "bring people together" to discuss minority communities' concerns about the criminal justice system. "We stand with the police department. No one has ever given up on the police department or said we were anti-police department. What we were crying for was saying how African-Americans feel, how their communities are policed and want the justice system to work for everyone," Meeks said on ABC's "This Week." Meeks and other members of the Congressional Black Caucus expressed outrage at the non-indictment of the two white police officers in the Brown and Garner cases and have led the outcry in Washington. Ray Kelly, a former New York City police commissioner, also knocked de Blasio for not standing with police officers, accusing him of running an anti-police election campaign when he campaigned against the stop and frisk policies. Kelly, also speaking on "This Week," said de Blasio's comments about teaching his black son how to deal with police led up to the police murders on Saturday. "I think when the mayor made statements about that he had to train his son to be -- his son who is biracial -- to be careful when he's dealing with the police, I think that set off this latest firestorm," Kelly said.